Brown has administered trusts for chief executive officers of Fortune 500 firms, including Travelers Insurance, Manufacturers Hanover Bank (New York), General Electric, Harris Corporation, and Oscar Meyer. He founded FAMILY OFFICE® after leaving Sun Bank, N.A. (now SunTrust N.A.). where he served as senior vice president and senior trust officer. He supervised all the bank’s trust departments in Central Florida, where assets under management exceeded $750 million. 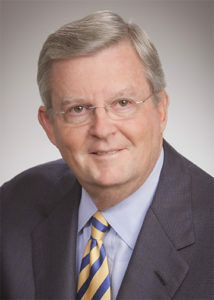 Beginning as a vice president in 1980, overseeing all personal trust accounts in the Orlando office, he was given responsibility for all the bank’s large and sensitive account relationships. Brown also worked in trust services for 13 years at NCNB (now Bank of America). When NCNB purchased one of its first out-of-state subsidiaries – Trust Company of Florida – Brown was selected to head its personal trust division in Orlando in 1974. Here he planned and administered one of the trust division’s largest estates, with fee income exceeding $1 million. He also created, administered, and served as officer and director of one of Florida’s largest private foundations, which has disbursed more than $30 million to New York and Florida charitable entities since 1980. Brown served in the United States Army at Fort Lesley J. McNair, in Washington D.C. He also served as a commander of a signal battalion, which supported a separate brigade of the 25th Infantry Division, during the Vietnam War. Brown earned his bachelor’s degree at Davidson College in Davidson, North Carolina, and continued his graduate studies in economics at George Washington University.